The goal of this document is to describe the OPNFV Functest test cases and to provide a procedure to execute them. In the OPNFV Colorado system release, a Functest CLI utility is introduced for easier execution of test procedures. An overview presentation has been created for the first OPNFV Summit . This document is a continuation of the OPNFV Functest Configuration Guide . IMPORTANT: It is assumed here that the Functest Docker container is already properly deployed and that all instructions described in this guide are to be performed from inside the deployed Functest Docker container. Functest is the OPNFV project primarily targeting function testing. In the Continuous Integration pipeline, it is launched after an OPNFV fresh installation to validate and verify the basic functions of the infrastructure. The current list of test suites can be distributed over 4 main domains: VIM (Virtualised Infrastructure Manager), Controllers (i.e. SDN Controllers), Features and VNF (Virtual Network Functions). smoke vPing_SSH NFV “Hello World” using an SSH connection to a destination VM over a created floating IP address on the SUT Public / External network. Using the SSH connection a test script is then copied to the destination VM and then executed via SSH. The script will ping another VM on a specified IP address over the SUT Private Tenant network. vPing_userdata Uses Ping with given userdata to test intra-VM connectivity over the SUT Private Tenant network. The correct operation of the NOVA Metadata service is also verified in this test. tempest_smoke _serial Generate and run a relevant Tempest Test Suite in smoke mode. The generated test set is dependent on the OpenStack deployment environment. openstack tempest_full _parallel Generate and run a full set of the OpenStack Tempest Test Suite. See the OpenStack reference test suite . The generated test set is dependent on the OpenStack deployment environment. rally_full Run the OpenStack testing tool benchmarking OpenStack modules See the Rally documents . onos Test suite of ONOS L2 and L3 functions. See ONOSFW User Guide for details. Features features Promise Resource reservation and management project to identify NFV related requirements and realize resource reservation for future usage by capacity management of resource pools regarding compute, network and storage. See Promise User Guide for details. Copper Copper develops OPNFV platform support for policy management, using open source projects such as OpenStack Congress, focused on helping ensure that virtual infrastructure and the apps that execute on it comply with the configuration policy intent of service providers, developers, and end users. See more detail in the Copper User Guide. As shown in the above table, Functest is structured into different ‘domains’, ‘tiers’ and ‘test cases’. 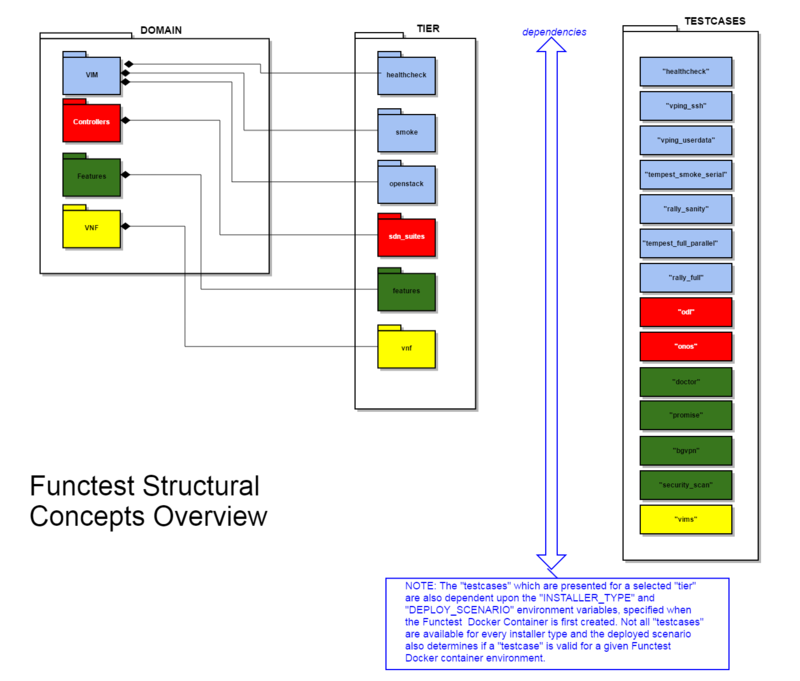 Each ‘test case’ usually represents an actual ‘Test Suite’ comprised -in turn- of several test cases internally. Test cases also have an implicit execution order. For example, if the early ‘healthcheck’ Tier testcase fails, or if there are any failures in the ‘smoke’ Tier testcases, there is little point to launch a full testcase execution round. Some of the test cases are developed by Functest team members, whereas others are integrated from upstream communities or other OPNFV projects. For example, Tempest is the OpenStack integration test suite and Functest is in charge of the selection, integration and automation of those tests that fit suitably to OPNFV. The Tempest test suite is the default OpenStack smoke test suite but no new test cases have been created in OPNFV Functest. There is no real notion of Test domain or Test coverage. Basic components (VIM, SDN controllers) are tested through their own suites. Feature projects also provide their own test suites with different ways of running their tests. vIMS test case was integrated to demonstrate the capability to deploy a relatively complex NFV scenario on top of the OPNFV infrastructure. Most of the tests are runnable by any combination, but some tests might have restrictions imposed by the utilized installers or due to the available deployed features. The system uses the environment variables (INSTALLER_IP and DEPLOY_SCENARIO) to automatically determine the valid test cases, for each given environment. In the Colorado OPNFV System release a convenience Functest CLI utility is also introduced to simplify setting up the Functest evironment, management of the OpenStack environment (e.g. resource clean-up) and for executing tests. The Functest CLI organised the testcase into logical Tiers, which contain in turn one or more testcases. The CLI allows execution of a single specified testcase, all test cases in a specified Tier, or the special case of execution of ALL testcases. The Functest CLI is introduced in more detail in the section Executing the functest suites of this document. The different test cases are described in the remaining sections of this document. In Colorado release a new Tier ‘healthcheck’ with one testcase ‘healthcheck’ is introduced. The healthcheck testcase verifies that some basic IP connectivity and essential operations of OpenStack functionality over the command line are working correctly. Self-obviously, successful completion of the ‘healthcheck’ testcase is a necessary pre-requisite for the execution of all other test Tiers. This test can be considered as an “Hello World” example. It is the first basic use case which must work on any deployment. When the second VM boots it will execute the script passed as userdata automatically. The ping will be detected by periodically capturing the output in the console-log of the second VM. Functest uses Rally  to run the Tempest suite. Rally generates automatically the Tempest configuration file tempest.conf. Before running the actual test cases, Functest creates the needed resources (user, tenant) and updates the appropriate parameters into the configuration file. When the Tempest suite is executed, each test duration is measured and the full console output is stored to a log file for further analysis. NOTE: Test case ‘tempest_smoke_serial’ executes a defined set of tempest smoke tests with a single thread (i.e. serial mode). Test case ‘tempest_full_parallel’ executes all defined Tempest tests using several concurrent threads (i.e. parallel mode). The number of threads activated corresponds to the number of available logical CPUs. The goal of the Tempest test suite is to check the basic functionalities of the different OpenStack components on an OPNFV fresh installation, using the corresponding REST API interfaces. 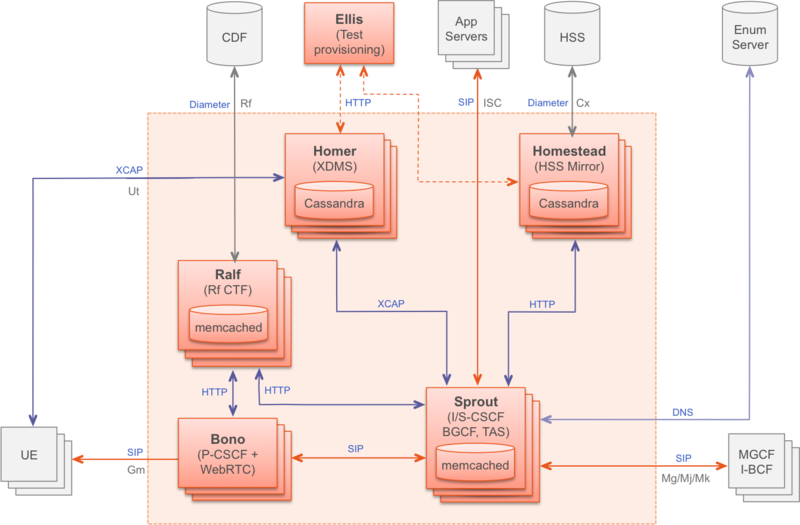 How does OpenStack work at scale? The goal of this test suite is to benchmark all the different OpenStack modules and get significant figures that could help to define Telco Cloud KPIs. A basic SLA (stop test on errors) has been implemented. NOTE: Test case ‘rally_sanity’ executes a limited number of Rally smoke test cases. Test case ‘rally_full’ executes the full defined set of Rally tests. The OpenDaylight (ODL) test suite consists of a set of basic tests inherited from the ODL project using the Robot  framework. The suite verifies creation and deletion of networks, subnets and ports with OpenDaylight and Neutron. Note: the checks in OpenDaylight are based on the returned HTTP status code returned by OpenDaylight. TestON Framework is used to test the ONOS SDN controller functions. The test cases deal with L2 and L3 functions. The ONOS test suite can be run on any ONOS compliant scenario. Most of the features have been developped by feature projects. Security_scan has been initiated in Functest repository but should soon be declared in its own repository as well. Security Scanning, is a project to insure security compliance and vulnerability checks, as part of an automated CI / CD platform delivery process. The project makes use of the existing SCAP format to perform deep scanning of NFVi nodes, to insure they are hardened and free of known CVE reported vulnerabilities. The SCAP content itself, is then consumed and run using an upstream opensource tool known as OpenSCAP. The OPNFV Security Group have developed the code that will called by the OPNFV Jenkins build platform, to perform a complete scan. 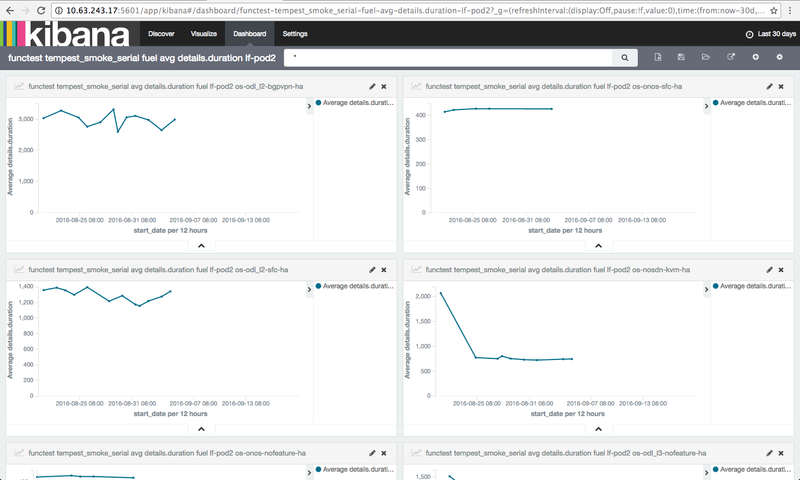 Resulting reports are then copied to the OPNFV functest dashboard. security_scan.py script is called, and a config file is passed to the script as an argument. A scan profile is matched to the node type. The OpenSCAP application is remotely installed onto each target node gathered on step 3, using upstream packaging (rpm and .deb). A scan is made against each node gathered within step 3. HTML Reports are downloaded for rendering on a dashboard. If the config file value ‘clean’ is set to ‘True’ then the application installed in step 5 is removed, and all reports created at step 6 are deleted. At present, only the Apex installer is supported, with support for other installers due within D-release. The IP Multimedia Subsystem or IP Multimedia Core Network Subsystem (IMS) is an architectural framework for delivering IP multimedia services. vIMS has been integrated in Functest to demonstrate the capability to deploy a relatively complex NFV scenario on the OPNFV platform. The deployment of a complete functional VNF allows the test of most of the essential functions needed for a NFV platform. If any of the above steps are missing please refer to the Functest Config Guide as they are a prerequisite and all the commands explained in this section must be performed inside the container. Note: In Colorado release, the scripts run_tests.sh is now replaced with a new Functest CLI. One difference, is that tests run through the Functest CLI will always clean-up OpenStack resources. See the Troubleshooting section of this document, where this difference is discussed. -h, --help  Show this message and exit. get-tests  Prints the tests in a tier. list       Lists the available tiers. run        Executes all the tests within a tier. show       Shows information about a tier. list  Lists the available testcases. run   Executes a test case. show  Shows information about a test case. 2016-06-30 11:45:05,351 - healtcheck - INFO -  ...Keystone OK! 2016-06-30 11:45:29,746 - healtcheck - INFO -  ... Glance OK! 2016-06-30 11:45:37,502 - healtcheck - INFO -  ...Cinder OK! 2016-06-30 11:45:54,261 - healtcheck - INFO -  ...Neutron OK! 2016-06-30 11:47:12,272 - healtcheck - INFO -  ...Nova OK! 2016-06-30 11:48:17,832 - healtcheck - INFO -  ...DHCP OK! 2016-06-30 11:48:17,835 - healtcheck - INFO -  Health check passed! Version 1 is deprecated, use alternative version 2 instead. WARNING:cinderclient.api_versions:Version 1 is deprecated, use alternative version 2 instead. 2016-06-30 11:51:34,664 - vping_ssh - INFO - Instance 'opnfv-vping-1' is ACTIVE. 2016-06-30 11:52:01,439 - vping_ssh - INFO - Instance 'opnfv-vping-2' is ACTIVE. 2016-06-30 11:52:21,108 - vping_ssh - INFO - vPing detected! 2016-06-30 11:52:21,108 - vping_ssh - INFO - vPing duration:'92.2' s.
Please note that for some scenarios some test cases might not be launched. For example, the last example displayed only the ‘odl’ testcase for the given environment. 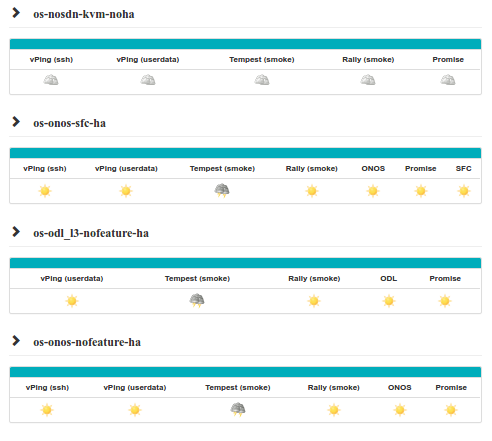 In this particular system the deployment does not support the ‘onos’ SDN Controller Test Case; for example. Important If you use the command ‘functest tier run <tier_name>’, then the Functest CLI utility will call all valid Test Cases, which belong to the specified Test Tier, as relevant to scenarios deployed to the SUT environment. Thus, the Functest CLI utility calculates automatically which tests can be executed and which cannot, given the environment variable DEPLOY_SCENARIO, which is passed in to the Functest docker container. 2016-06-30 12:03:36,676 - healtcheck - INFO -  ...Keystone OK! Functest includes a cleaning mechanism in order to remove all the OpenStack resources except those present before running any test. The script $repos_dir/functest/utils/generate_defaults.py is called once when setting up the Functest environment (i.e. CLI command ‘functest env prepare’) to snapshot all the OpenStack resources (images, networks, volumes, security groups, tenants, users) so that an eventual cleanup does not remove any of these defaults. The script clean_openstack.py which is located in $repos_dir/functest/utils/ is normally called after a test execution. It is in charge of cleaning the OpenStack resources that are not specified in the defaults file generated previously which is stored in /home/opnfv/functest/conf/os_defaults.yaml in the Functest docker container. It is important to mention that if there are new OpenStack resources created manually after preparing the Functest environment, they will be removed, unless you use the special method of invoking the test case with specific suppression of clean up. (See the Troubleshooting section). The reason to include this cleanup meachanism in Functest is because some test suites such as Tempest or Rally create a lot of resources (users, tenants, networks, volumes etc.) that are not always properly cleaned, so this function has been set to keep the system as clean as it was before a full Functest execution. As mentioned previously, the Functest Docker container preparation as well as invocation of Test Cases can be called within the container from the Jenkins CI system. There are 3 jobs that automate the whole process. The first job runs all the tests referenced in the daily loop (i.e. that must been run daily), the second job runs the tests referenced in the weekly loop (usually long duration tests run once a week maximum) and the third job allows testing test suite by test suite specifying the test suite name. The user may also use either of these Jenkins jobs to execute the desired test suites. One of the most challenging task in the Colorado release consists in dealing with lots of scenarios and installers. Thus, when the tests are automatically started from CI, a basic algorithm has been created in order to detect whether a given test is runnable or not on the given scenario. Some Functest test suites cannot be systematically run (e.g. ODL suite can not be run on an ONOS scenario). Moreover since Colorado, we also introduce the notion of daily/weekly in order to save CI time and avoid running systematically long duration tests. Keystone, Glance, Cinder, Neutron and Nova. Set of basic Functional tests to validate the OpenStack deployment. The order of execution is the one defined in the file if all test cases are selected. As explained before, at the end of an automated execution, the OpenStack resources might be eventually removed. Please note that a system snapshot is taken before any test case execution. This testcase.yaml file is used for CI, for the CLI and for the automatic reporting. In manual mode test results are displayed in the console and result files are put in /home/opnfv/functest/results. Results are automatically pushed to the test results database, some additional result files are pushed to OPNFV artifact web sites. Based on results collected in CI, a test dashboard is dynamically generated. This section gives some guidelines about how to troubleshoot the test cases owned by Functest. This section covers the test cases related to the VIM (healthcheck, vping_ssh, vping_userdata, tempest_smoke_serial, tempest_full_parallel, rally_sanity, rally_full). After these actions, the test cases differ and will be explained in their respective section. In this Colorado Funtest Userguide, the use of the Functest CLI is emphasized. The Functest CLI replaces the earlier Bash shell script run_tests.sh. The Functest CLI does not yet support the option to suppress clean-up of the generated OpenStack resources, following the execution of a test case. Explanation: After finishing the test execution, the corresponding script will remove, by default, all created resources in OpenStack (image, instances, network and security group). When troubleshooting, it is advisable sometimes to keep those resources in case the test fails and a manual testing is needed. It is actually still possible to invoke test execution, with suppression of OpenStack resource cleanup, however this requires invocation of a specific Python script: ‘/home/opnfv/repos/functest/ci/run_test.py’. The OPNFV Functest Developer Guide provides guidance on the use of that Python script in such troubleshooting cases. This will spawn a VM using the network created previously manually. In all the OPNFV tested scenarios from CI, it never has been a problem with the previous actions. Further possible problems are explained in the following sections. If this is displayed, stop the test or wait for it to finish, if you have used the special method of test invocation with specific supression of OpenStack resource clean-up, as explained earler. It means that the Container can not reach the Public/External IP assigned to the instance opnfv-vping-2. There are many possible reasons, and they really depend on the chosen scenario. For most of the ODL-L3 and ONOS scenarios this has been noticed and it is a known limitation. If the message Sending discover and No lease, failing is shown, it probably means that the Neutron dhcp-agent failed to assign an IP or even that it was not responding. At this point it does not make sense to try to ping the floating IP. If the ping does not return anything, try to ping from the Host where the Docker container is running. If that solves the problem, check the iptable rules because there might be some rules rejecting ICMP or TCP traffic coming/going from/to the container. Further troubleshooting is out of scope of this document, as it might be due to problems with the SDN controller. Contact the installer team members or send an email to the corresponding OPNFV mailing list for more information. This test case does not create any floating IP neither establishes an SSH connection. Instead, it uses nova-metadata service when creating an instance to pass the same script as before (ping.sh) but as 1-line text. This script will be executed automatically when the second instance opnfv-vping-2 is booted. it means that the instance failed to read from the metadata service. Contact the Functest or installer teams for more information. NOTE: Cloud-init in not supported on scenarios dealing with ONOS and the tests have been excluded from CI in those scenarios. Resources required for test case execution are missing Such resources could be e.g. an external network and access to the management subnet (adminURL) from the Functest docker container. OpenStack components or services are missing or not configured properly Check running services in the controller and compute nodes (e.g. with “systemctl” or “service” commands). Configuration parameters can be verified from the related .conf files located under ‘/etc/<component>’ directories. Some resources required for execution test cases are missing The tempest.conf file, automatically generated by Rally in Functest, does not contain all the needed parameters or some parameters are not set properly. The tempest.conf file is located in directory ‘/home/opnfv/.rally/tempest/for-deployment-<UUID>’ in the Functest Docker container. Use the “rally deployment list” command in order to check the UUID the UUID of the current deployment. When some Tempest test case fails, captured traceback and possibly also the related REST API requests/responses are output to the console. More detailed debug information can be found from tempest.log file stored into related Rally deployment folder. The same error causes which were mentioned above for Tempest test cases, may also lead to errors in Rally as well. -n, --noclean  Don't clean the created resources for this test. If the flag all is specified, it will run all the scenarios one by one. Please note that this might take some time (~1,5hr), taking around 1 hour alone to complete the Nova scenario. To check any possible problems with Rally, the logs are stored under /home/opnfv/functest/results/rally/ in the Functest Docker container. If the Basic Restconf test suite fails, check that the ODL controller is reachable and its Restconf module has been installed. If the Neutron Reachability test fails, verify that the modules implementing Neutron requirements have been properly installed. If any of the other test cases fails, check that Neutron and ODL have been correctly configured to work together. Check Neutron configuration files, accounts, IP addresses etc.). Please refer to the ONOS documentation. ONOSFW User Guide . Please refer to the dedicated feature user guides for details. OPNFV functional test page: opnfvfunctest. © 2016, OPNFV. Licenced under CC BY 4.0.